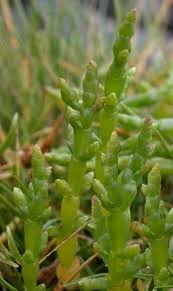 Samphire(marsh) grows on the coastal marshes by the sea coast of Northern Europe. The leaves are narrow, bright green and salty. As a food usually cooked in butter or steamed like asparagus. 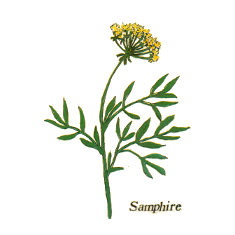 Said to be diuretic and aids digestion. High in vitamin C and iodine.